Serving God gives us life and purpose; it inspires in us a sense of identity and motivates us to serve our global communities. It is to this end that RAA Campus Ministries Team plans and executes regular mission trips around the world. This year’s trip is a joint venture between Redlands SDA Church and Redlands Adventist Academy. The trip will be an international mission trip to Orange Walk Town, Belize. If you wish to support our trip financially please send a check or cash to Redlands SDA church with "RAA Belize Trip" in the memo line. Also please continue to support us by earnestly praying for not only our team here States side preparing to go but also our team already on site working and preparing for our arrival. Thank you for your continued support of the RAA Campus Ministries ﻿T﻿eam. A small group of RAA students, took a trip to Fiji to do mission work. A group of 20 went to Ecuador from July 17- 28, 2013. This summer I had the chance to go to Ecuador for a mission trip and it definitely was one of the highlights of my year. 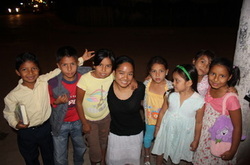 I did some construction work but the main thing I helped with was the children's program. It was a challenge trying to teach the kids with the language barrier but my team and I had a good experience overall with the kids from my church. I was touched by how eager all the kids were to learn about the Bible. There was one time where I had a Bible verse reading with a few kids who wanted to stay afterwards and we spent about 30 minutes reading verses (I would read it in English and then one of the kids would read it in Spanish). The kids there were also very eager to tell others about God! One day, we had to pass out books in the town we were in and these two little girls were running around passing them out and talking with the adults there! I thought about what I would've done if someone had asked me to pass out books here. Would I have been just excited as these little girls? Anyway, I really felt like I was being used by God in Ecuador. Even though I thought I didn't do much, the people there were so grateful and I was really blessed by them and their faith. I definitely want to go on another mission trip like this. It opened my eyes to how good I have it and how blessed I am here at home. It was a very inspiring trip and I felt somehow closer to God after it. Redlands Academy has adopted Tennessee Street stretching from RAA all the way until the I-10. Once a quarter, we will head out to Tennessee to clean the street by picking up trash, cutting down bushes and pulling out weeds. Look out for the date of the next Adopt-A-Street! Many people believe mission work can only be done in foreign lands, In reality, people in our own country, our own state, our own cities, need service too. During the holiday season, a group of Redlands Academy students will head down to LA and serve the people there.